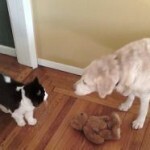 NJ Pet Sitters would like to recognize Traci from Rutherford , New Jersey as Pet of the Month for October 2011. 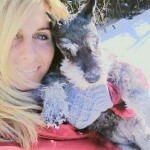 Traci is a 16.5 year-old Schnauzer, who fights the fight every day for her owners Kristin and Justin. Traci has had a very difficult year fighting Cushings and Arthritis, and is also battling Vertigo for the past month. She is a tough little girl who keeps surprising everyone, beating all the odds. She is the sweetest Schnauzer we have met. Great Job To Traci for being a wonderful companion and friend to us here at NJ Pet Sitters. Bailey is our Pet of the Month for March 2011 from Teaneck in Bergen County, New Jersey. He is a remarkable 14 year-old Labrador who is a retired “search” dog. Bailey loves to do extra sniffing on his walks with us, and remember his working days. 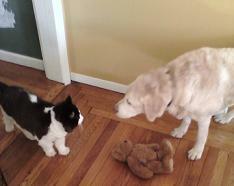 Bailey always greets us at the door for his daily dog walk with a stuffed teddy bear in his mouth, just making our day. Bailey takes his medicine for thyroid and arthritis like a trooper. We love his owner as well because she is careful with Bailey’s diet which can be hard with Labs, keeping him trim and healthy. At NJ Pet Sitters LLP we love to see such responsible and loving pet owners!